My mother set up a pottery studio years ago. Over the years I’ve seen her grow and expand not only her physical studio but also her practice. She makes and sells her own work and opens her studio weekly so others can learn how to build and throw. 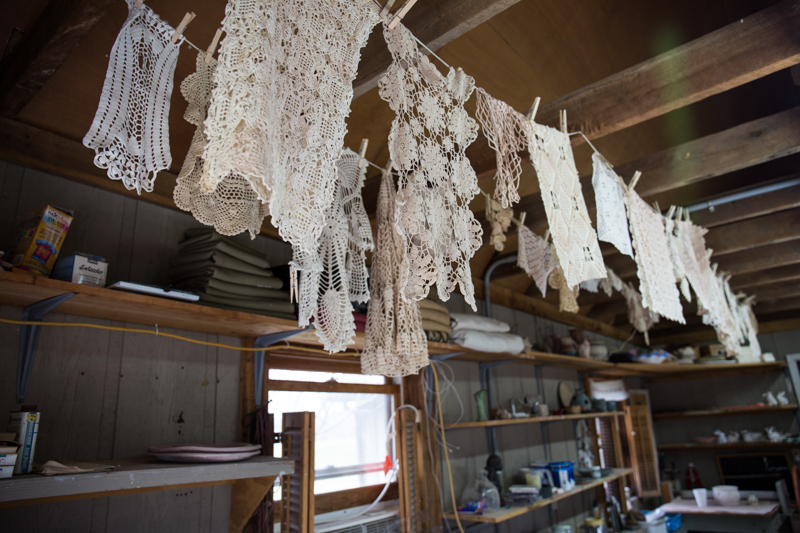 Crocheted doilies hanging at Ewell Farm Studio ready to be pressed into clay. My father’s woodworking shop is supposed to be half of the studio; however, more often than not his space is overrun by drying plates, pots and serving platters. I overtook it while painting. The table where I painted all of the vases. You can see my father's woodworking shop in the background. He creates beautiful wooden bowls and spoons. I hope to collaborate with him in the future. About 5 years ago I attempted to paint on her work (see below). It was done on a whim during one of our visits and you can also see that my mother was still experimenting with how to get the perfect plate. Since then she has mastered dinnerware, and I’m fortunate to have a full set that we use daily. When a plate or mug breaks, I know who to call to “order” a replacement— a huge benefit to having a potter-mom. At the end of 2017, I proposed a collaborative series with my mom. She’s always up for new challenges so I wasn’t surprised when she said yes. Over the following weeks and months we discussed color, shapes, sizes, process and timing. 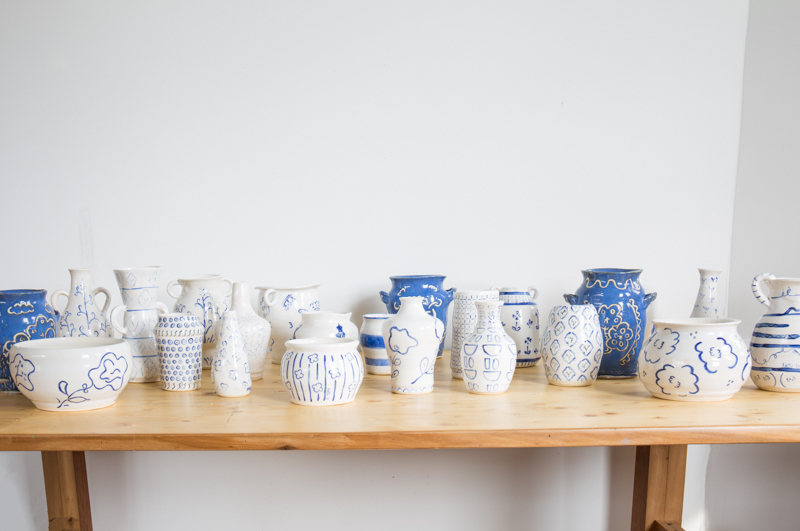 I got a crash course in underglaze, types of clay and bisque firing. Once we had the initial plan in place, she diligently created a variety of vases based on sketches I created for her. I looked through my previous paintings to capture the shapes of vases I’ve been painting over the years. Before I arrived in Tennessee to paint the vases, I spent several weeks researching ceramic designs and started sketching in my sketchbook then moved to practicing painting on paper cups. Initially I thought I would use lots of colors similar to my paintings; however, as time neared to paint, I decided to limit the unknowns and embrace working with the classic color combo of blue and white. My inspiration came from many places; however, three of my greatest sources of inspiration came from the paintings on ceramics by Vanessa Bell (did you know she and Virginia Woolf were sisters?!) and Henri Matisse, the patterns of the French Domino papers, the beautifully crafted and designed works of Royal Copenhagen and Iznik pottery. The week leading up to our visit, Mom bisque fired the vases. All 25 vases were waiting for me when I arrived in Tennessee with my family for spring break. After the 8 hour car drive from Chicago, I jumped right in and started painting. We fired the first vase that night to see how colors turned out. We had to make a few adjustments and cross our fingers along the way. In the end, our collaboration was a success and I hope this is the first of many. Sketchbook open and midway through painting this whimsical vase. I enjoyed working with the big studio door open. The last three vases I painted were done with wax resist then dipped in blue glaze. We are thrilled with how these came out. More of these to come, I hope! My daughter painting her own vase alongside me at Ewell Farm Studio. Perhaps this is foreshadowing of a future collaboration. All of the vases will be available soon for purchase on this web site. Please join my email list below if you would like to be the first to know!